It's raining outside again, which is unusual for here. we have around here. We displayed some at our Fanciful Twist's Halloween Tea. Maybe we will put some on the Christmas tree. I'm not the first to crown pumpkins. Dore makes beautiful wire crowns. Out in the garden, the winter garden is planted. But it is also a wonderful time for roses. They are blooming again after a hot summer! Maybe they will bloom until May if we don't have a few days of cold this winter. My lettuce is also ready again, and I also have some wildflowers. I enjoyed this from Sarah. The dimpled glass looks vintage next to pretty French goblets made in France with bumble bee embellishment. I'm going to make a least one pair of my angel wings. It prepares me for the holidays. 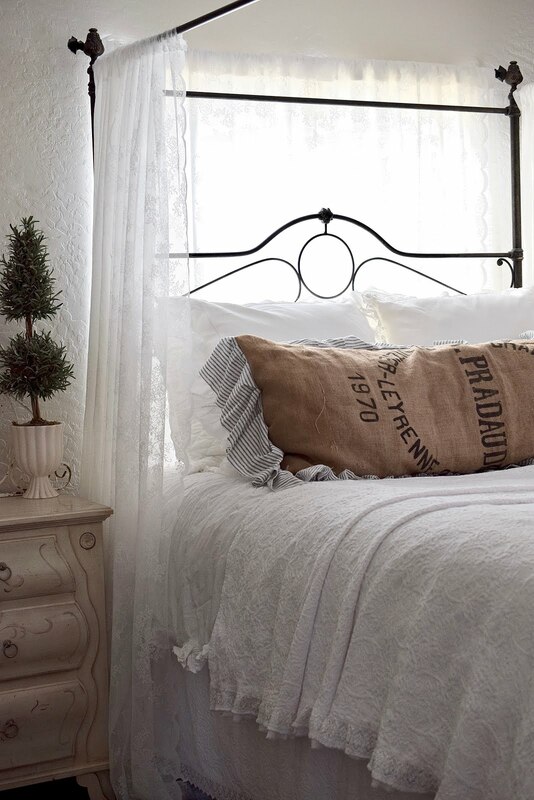 I use worn sheets and chicken wire. 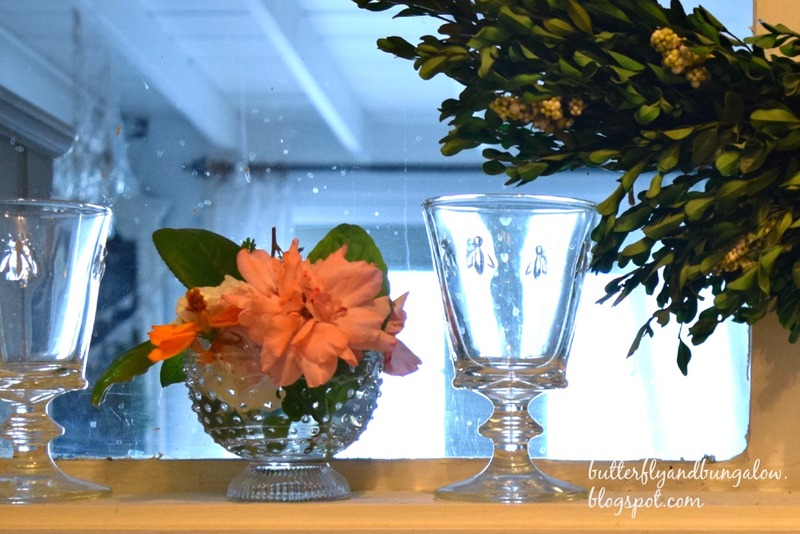 I also dry some of the flowers that I find in the yard or bring home, and then scatter them on the table, or I fill one of the dimple glasses with them. And since I love drawing on the chalkboard, I'm painting some canvases black and drawing on them with white pastel. 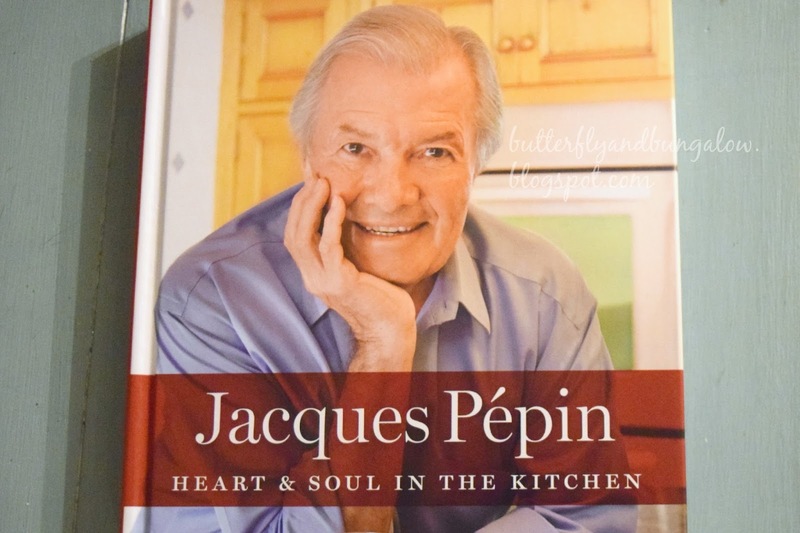 Finally, I am reading Jacque Pepin's new book Heart and Soul in the Kitchen. He writes my favorite cookbooks. He is Simple Beautiful Food. This book is extra special. It's a hardcover. It is also autobiographical. ( The French chef is nearly eighty and multi-talented.) Besides many doable recipes, he writes about simplicity and the beauty of food, wine, family, his career path, and so on. The photographs are lovely, but I also love the simple art illustrations, which I think are mostly his. His master degree was in French literature and his Phd in food in French literature. It is my favorite cookbook ever, and probably destined to be a must have for some cooks. I will be making miso salmon soon and his chicken soup. Also, once again, he has a cooking show on PBS. And that's it. I'm sharing this at Kerrianne's, because she said it was time to share what we are creating or preparing for the upcoming holidays. I am also sharing at RJ's Art at Home's Literary Friday. Thank you for visiting, and enjoy your holiday weekend. While you were leaving a comment on my blog, I was looking at yours! The crowns are turning out darling and your tree idea is great. Love the glassware! Such unique and lovely ideas! 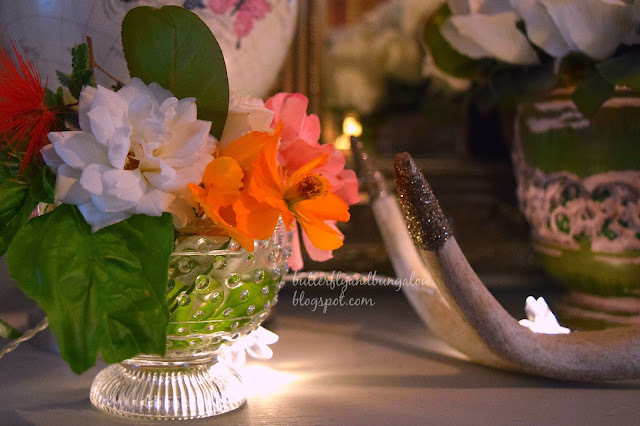 Love the use of lace for crowns, love the scattered dry flowers, love the impromptu arrangements, love the creamy white roses. I have never heard of Jacque Pepin, but his work sounds amazing- thanks for the recommendation! Hope you continue to enjoy your fall Su! Thank you, Nicki. He has a show on PBS. I love to watch Jacques Pepin's cooking shows and he makes it look so easy to cook haute cuisine! Have a great weekend! You do have realy a fantastic hand for decorations. What a lovely idea to give the pumpkin a crown. Love it. The iron in the first photo -> amazing!!!! The flowers are very beautiful, i love it! The prettiest crown I have seen- I want one! I am in love with your crown! What fab idea is that?! I have to try and make one just for the fun of it! Or I might use it as a photo prop! So lovely! and romantic - you have the prettiest style! Lovely post, full of delightful times spent at home. Always a joy to visit here, Su. Sue love your Santos with the crown. Beautiful. 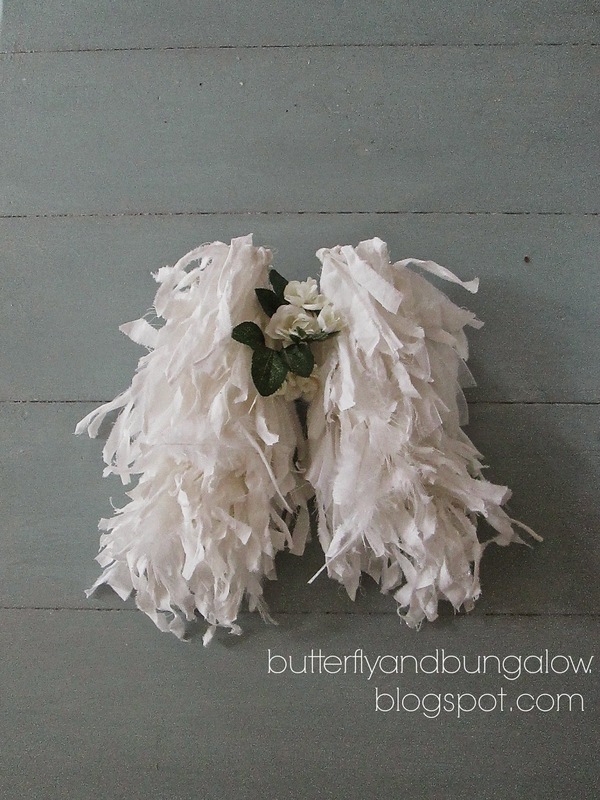 I am doing angel wings in my holiday decor this year and I love the one you are going to make. So pretty. Happy Halloween. Love the crown....so adorable! And those angel wings! Hope you give a tutorial on how to make those!! Hugs!! When I first started following your blog we in Philadelphia were locked in surviving harsh winters winds and bitter cold. I fell in love with your posts from you winter garden and honestly it is a term that intrigues and fascinates me. My winter garden (? Garden in winter) looks out on stone walled beds with manicured boxwoods in pea gravel that get covered by snow and in a haunting beautiful way satisfy my soul. While the entire time I'm hoping they will not be bite by frostbite and return with new growth in the Spring. I did indeed notice your delightful crowns on your table in your Halloween post with Fanciful twists also your adorable Cootie catchers - fortune tellers that I hadn't made since many moons have passed! I have been inspired by you to make them in origami printed papers and set them in a bowl with my next dinner party. For like you I feel life needs to be embraced and celebrated in a playful way. And dear Su this is the reason your blog remains one of my top favorites. I've been working my way through "The French Laundry" cookbook, beautiful and recipes a tad more culinary ( code difficult) and then my next cookbook to tackle and experiment from is Jacques Pépin's. I need to purchase it on Amazon soon. Happy Halloween to you and your family, sending boo kisses and love. Thank you, Vera. Your garden sounds beautiful in the winter. I really miss that there is no fall here with changing leaves, unless we drive north, and I do love the photos of snow. But I've lived most of my life in warm weather and cannot tolerate cold. To get my fix, usually once a year I go to Santa Fe either in the fall or the winter for just a few days. A long weekend will make me nostalgic for when I lived in the high desert for a few years. We had a lot of fun folding those with pretty papers, and writing silly things on the inside like "boo". 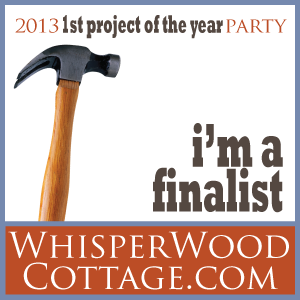 They will be perfect for your table and fun for your guests. I love your crowns. They are so much fun. Great photos Su and I love the flowers with the chalkboard! I do love the crowns y'all made. You really must put them on a Christmas tree....they would be so pretty on one! Your roses are so pretty. I remember when we lived in Arizona our roses were always so pretty (except during the summer) and they NEVER had black spots on them like they often have here in Alabama. Wow, this cookbook sounds like something I would LOVE. I'm putting it on my Christmas wish list. Jacques Pépin has quite the resume! Have you ever read any of Peter Mayle's books about Provence? I think you might like them! Thanks so much for linking up to Literary Friday. It means so much to me! Your crowns turned out so well, they are very pretty. You are so lucky that you received some rain. We have not had any here in Fullerton. So glad that your winter garden is doing well. I need to get some lettuce seeds and plant them. Planted quite a few herbs and they are doing very well, as I hand water from the water that I save. 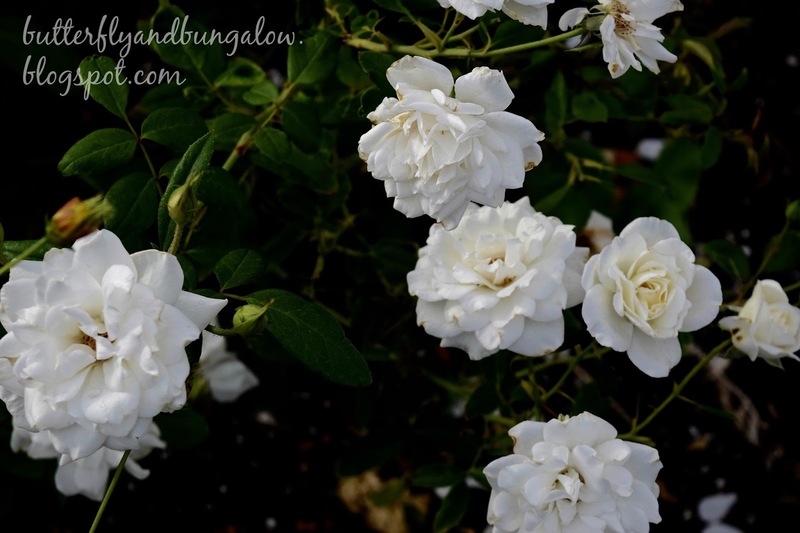 My roses did very poorly this summer, not big blooms, looked more like miniature roses. i had the gardener dead head them back quite a bit and now they look more like they should. I will not prune them down since it doesn't get cold here. I so enjoy your posts - thank you. Have a great Halloween . Ahhh Jacques.....love, love, love. You can't beat the French style of cooking and entertaining. Lovely photos around your home, especially your artistic chalkboard and lovely flowers. I won't be seeing flowers in our gardens until next June! Happy Halloween! So nice that your roses are blooming. I don't have a single one this year, when they usually re-blooms in October. 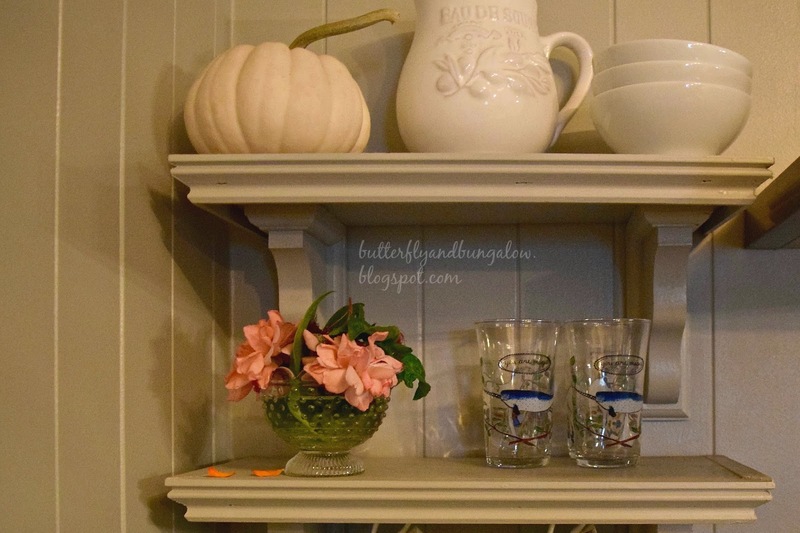 The pummkin on your kitchen shelf is the perfect autumn touch. There is always something lovely to see. Lovely post Su. Your pictures are beautiful. I love your wings and crowns. Wishing you a wonderful weekend. The crowns are so pretty and the roses are very special. 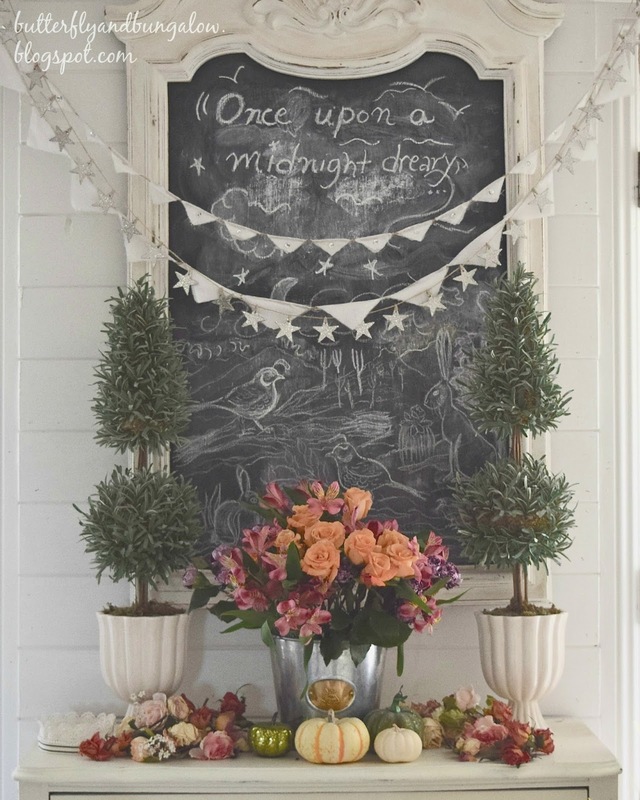 Loving the chalkboard and vignette. This makes me want a second house to decorate. Happy Halloween. Su, such a beautiful simple Autumn here, the lace crown oh yes, every pumpkin needs a crown. Love the mix of flora and pumpkins, leading us into fall. I am so looking forward to winter here as last years winter chill warmed us with inspiration with you. I'm so happy to know about the book as I admire him so much. My favorite cookbooks are memoir written. If it doesn't have stories in them, I'm not very interested in them. Your getting ready for winter and the holidays sounds productive and creatively fulfilling, Su. I do love those bumblebee glasses! Thank you, Dewena. I really do like this cookbook. If found those glasses around here, but they are made in France. Everything is so beautiful! I love those crowns and the dimpled bowls are really cute. Happy November! As always, your home is filled with beautiful creations that inspire one to copy. I loved revisiting that unique city of Venice with one click on your link. Thank you for sharing. Wishing you and yours a wonderful week. 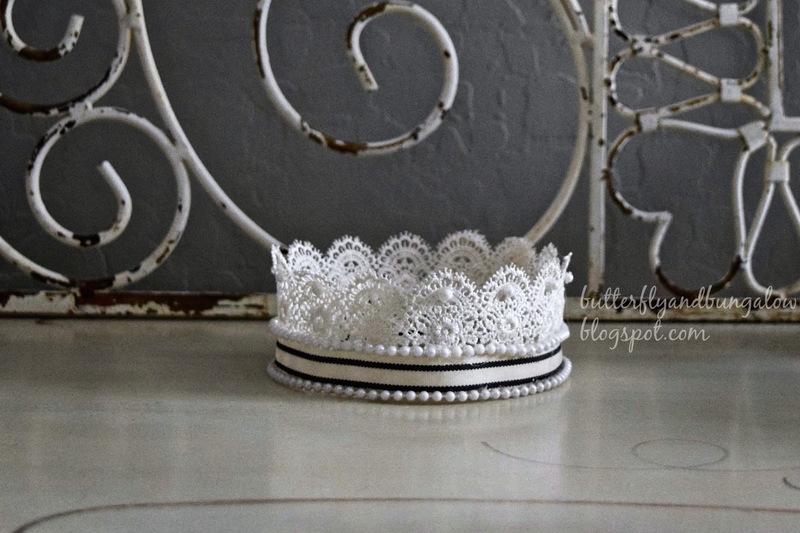 Those crowns that you are working on are beautiful and how sweet that you make them from left over materials. You are very resourceful and creative. I am also a foodie and love cooking for family and friends. Jacque Pepin is one of my favorite chefs. He is simply an incredible and talented chef without all the big celebrity persona. I do not have that particular book yet but plan to buy it soon. Such an inspiring visit today Su. 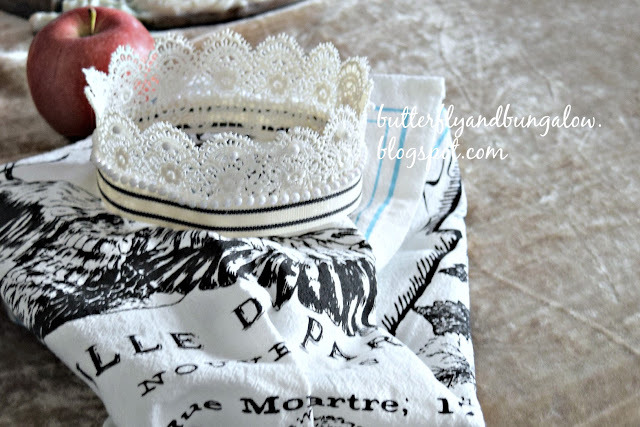 I adore the lace crowns and the beauty found in your lovely home.